"As dogs age, the knee degenerates from use. This weakening causes knee problems. Other causes are when the knee receives too much stress, such as the case of extreme exercise such as catching a Frisbee, being overweight, or as seen in larger breed dogs. Knee problems can also be mistaken for a hip joint problem, which is in the case of 1/3 of dogs. Each of the various conditions described below could cause the need for surgery or other medical treatments." A dogs knee or stifle join is made up of several bones, ligaments and muscle. from the Atlas of Veterinary Clinical Anatomy. Torn or injured ligaments is a common problem in dogs (also called Cruciated Ligament Rupture). In fact, 20% of dogs will suffer from the problem. It can be caused from jumping, such as for a Frisbee, or jumping from a step or car. If a dog lands the wrong way, is older or overweight, then there is a chance that the ligament was damaged. The problem is seen in larger dogs, dogs that are overweight and certain breeds such as Rottweilers and Labrador Retrievers. Dogs with a ligament problem show signs of pain up to 2 weeks after the injury. If the ligament isn't torn, then the pain could subside, only to return 2 to 4 weeks later. Since the ligaments hold the bones in place, if they aren't holding them in the correct position or causing instability, damage and arthritis can set in. Diagnosis of the joint will involve physical examination and X-Rays. For dogs over 20 pounds, Dog knee surgery, if conditions indicate, is often used to correct the situation. One surgical approach is to use a suture on the outside of the knee to stabilize the joint. Another approach, called TPLO, reshapes the bone. Both approaches have a high rate of success. Recovery takes from 8 to 16 weeks until a dog can resume normal activities. For dogs under 20 pounds, medications instead of surgery may be used to reduce any inflammation and thereby the pain associated with the problem. Pitellar Luxation - Is another name for kneecap dislocation. This is a common problem affecting both large and small dogs, but particularly occurs in small breeds and miniature breeds. It is caused by injury or develops naturally over time. If the condition is discovered during a veterinary exam, and if physical limitations, pain or other symptoms do not exist, a veterinarian may advise to not treat, but watch the condition over time. Symptoms of pitellar luxation in dogs include limping or lameness. There may not be any noticeable symptoms. When diagnosed, injuries are graded on a scale from I to 4, with I meaning a knee that can be moved manually, but is in the correct position through 4 where the knee is permanently out of position. An inherited form of the condition, Medial Patellar Luxation, can usually be diagnosed within 6 months from birth. Lateral Petallar Luxation has a sympom that makes a dog look like it is crouching. Similar canine knee surgery techniques are used. The third form is called Traumatic Luxation which occurs due to an injury which causes a Grade 1 problem. Grades 1, 2 and sometimes 3 can often be managed without dog knee surgery using rest and medications. Dog knee surgery can utilize several techniques including cutting the ligaments (patellar ligament desmotomy), surgical replacement of one of the ligaments (femoropatellar ligament), transplantation of the tibial crest and osteomy (reshaping) of the tibia or femur. Fractures in the dog knee joint usually effect the sesamoid bones, distal femur, proximal tibia and the patella. Femur fractures are common. Surgery can reshape the bones and help stabilize the knee and restore function. Fractures of the proximal tibia are treated with a dog knee surgery technique where a "buttress plate" is used to repair the fractured bone. In smaller dogs a pin can sometimes be used to repair the fractured area without reconstruction of the bones involved. Degenerative joint disease (also called canine arthritis and DJD) is another problem can impact dog knee function. It is caused by age, injury or disease. 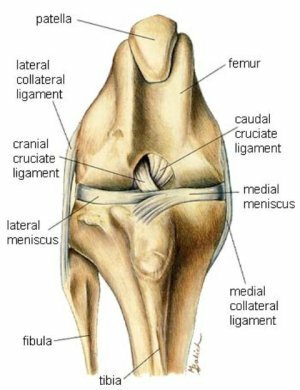 Arthritis in the knee joint occurs due to a loss of tissue in the area such as degeneration of the cartilage. The majority of cases are thought to be secondary, which means that it is the result of another condition. Arthritis is characterized by inflammation. There are many conditions that can cause knee joint arthritis including spinal cord problems, brain lesions, nerve injury, bone fractures, neoplasia (tumors), and tissue problems such as infection or a muscular injury. Symptoms of DJD include lameness or a change in the way a dog walks. You may notice a dog unable to do things it could do before. Problems that are thought to be arthritis could be hip dysplasia. Diagnosis of dog osteoarthritis, arthritis and DJD is done via X-Ray. Arthritis is not cured, but its symptoms are treated in order to improve the quality of life for the dog. Rest and physical therapy techniques can be used to help reduce inflammation. Medications such as analgesics can help to reduce inflammation. Dog knee surgery may be helpful in some cases. Aspirin has few side effects and is tolerated well when given with an antacid. Another medication, Phenylbutazone,a nonsteroidal anti-inflammatory drug has also been effective in helping treat the symptoms of arthritis. If a dog doesn't respond to aspirin therapy or phenylbutazone, then another class of drugs, Corticosteroid, may be prescribed. These should be used with caution as one side effect is gastrointestinal hemorrhage. There is also a homeopathic treatment available called PetAlive Muscle & Joint Support Formula that could provide additional support. It contains natural ingredients such as glucosamine which have some clinical support. The manufacturer provides clinical studies and information that will help owners understand this added level of support. Acupuncture has also been tried in dogs for arthritis, although there are no clinical studies supporting its use. Surgery is used when it can improve the function of the joints or if it can help a dog that is in pain. In extreme cases arthrodesis, or surgical fusion of the joint is recommended, although the patient will lose use of the joint.